Cost to have blueprints for a new home drafted varies greatly by region (and even by zip code). Get free estimates from drafters in your city. Cost to have blueprints for a new home drafted varies greatly by region (and even by zip code). Get free estimates from drafters in your city. How much does it cost to have blueprints for a new home drafted? Creating a blueprint or house plan is one of the first steps of building a new home. Blueprints or house plans are created by a draftsman for a new home design or a home addition. You can either purchase pre-created house plans or demand a house plan drafted from scratch by a draftsman or architect. 3-bedroom house plans are commonly requested and are used for the standard example project in this guide. The cost will vary depending on whether or not the homeowner wants to use a pre-created house plan or have an architect design a totally new blueprint 1. Pre-created house plans are designed by architects and can be purchased online. Modifiable house plans, or plans that can be altered by an architect or otherwise customized, will cost 20%-40% more than non-modifiable plans. Most homeowners will need modifiable plans in order to make their preferred changes or otherwise customize the plan due to the construction requirements. 3-bedroom house plans are very popular and range from $800 to $2000. A normal hourly rate for a draftsman will be around $100-$130 per hour. Architects will charge slightly more at $100-$140 per hour for a blueprint 1. A typical 3 bedroom house will take about 10 hours to complete and will cost about $1000 to $1300 for the first drawing. Customizations are further charged on an hourly basis and can add an additional $800 to $1400. The blueprint 1 may be designed by hand and printed on vellum paper, which is the traditional method of creating a blueprint 1. They may be designed using AutoCAD 2 software, which is the way that the vast majority of blueprints 1 are created today. AutoCAD 2 CD-ROMs can cost an additional $400 to $1000 and are the most popular format for making house plan modifications. CAD is used for 99% of blueprint 1 drawings, but in the rare occasion that a hand drawing is needed, it will normally cost more than a CAD design due to the longer length of time required. Pre-created luxury house plans can cost more, from $1200 to $3000 as well as more complicated and larger 4 and 5 bedroom homes. Luxury homes designed from scratch can take 24 hours to create and cost $2400 to $3120 for the first drawing, not including customizations. In general, the more complex a home is in terms of size and interior and exterior features, the more time it will take in order to design it from scratch, which will lead to the cost to design complex homes being higher. Draftsmen are not the same as architects; a draftsman's design will need to be signed by a structural engineer and an architect before they can be used for a home construction. Architect plans must only be approved by a structural engineer but their blueprint 1 design fee is slightly higher than a draftsman. Structural engineering costs average 8% of total construction fees. Permits are a separate charge and the cost can range from $300 to $1200. The cost will vary based on the size of the home, its features, and the jurisdiction. Permits can be obtained with the help of the architect who approves or designs the blueprint 1. Zoning is a legal concern that architects can also assist with, and the new home must be constructed in an area that is properly zoned for residential buildings. There are environmentally friendly or "green" blueprints 1 available that can be designed from scratch or purchased pre-designed. These blueprints 1 use eco-friendly materials for their home design and have a lower overall impact on the environment, being their cost similar to regular blueprints 1. The more changes that are made to a blueprint 1, the higher the design cost will be because of the fact that it's charged hourly. It's a good idea to have a clearly defined project in mind before hiring a draftsman or an architect to design a home, otherwise the final cost may be much higher than anticipated. If a blueprint 1 is needed in a faster timeframe, there can be a surcharge of 15%-20% of the regular hourly cost or more. How much does it cost to have blueprints for a new home drafted in my city? Cost to have blueprints for a new home drafted varies greatly by region (and even by zip code). To get free estimates from local contractors, please indicate yours. 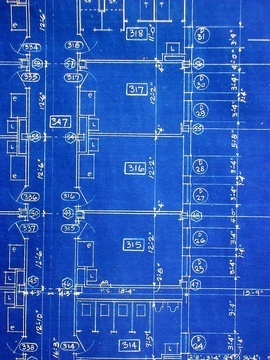 Cost Considerations: Traditional blueprints take the most time because they must be drawn by hand. Using CAD software makes the process faster and therefore cheaper. It may also be possible to make changes to an existing blueprint if the project is a minor addition to an existing structure. This would save money compared with having an entire blueprint drawn. A draftsperson usually charges $100 to $130 an hour, and drawing a CAD blueprint for a 1,000 square foot space takes about 8-16 hours. A range of software programs by Autodesk that enable architects and designers to use a computer to create, test, and make changes to digital models of what they want to build before they build it. Cost Considerations: Blueprints designed using CAD are cheaper than hand-drawn blueprints because the process is much faster. 99% of blueprints are made using CAD.